My third cousin Irene (found with DNA) complained to me via email that her ethnicity results at 23andMe were very different from Ancestry ; what was going on? Irene’s recent ancestry is known to be half Norwegian (my side) and half Scottish with some Irish (about 6% expected) mixed in. So I looked and saw that 23andMe (above right) has a very low estimate for Scandinavian for her, while the British and Irish (her Scottish) is fine. 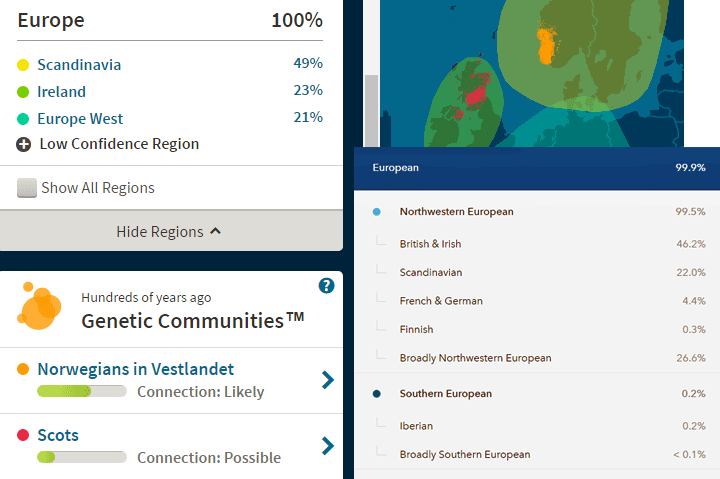 Ancestry DNA (above left) has the Scandinavian predicted correctly but calls her Scottish both Irish and Western European. At least it includes her in a Scots genetic community which is correct and very cool. Since I had also uploaded her DNA results to Family Tree DNA, I checked there and saw that they correctly predicted 49% Scandinavian. However the Scottish shows as 36% British Isles followed by some traces including 9% East Europe? No one else saw that! One of the problems is that our Viking ancestors visited and even settled in various parts of the British Isles making it hard to tell British from Scandinavian. Also there was more migration within Europe many hundreds of years back than we might realize. Finally each company uses different reference populations and techniques for their ethnicity estimates. Predicting where your ancestors originated based on your DNA test is just not that accurate yet. The broad strokes are pretty good, but since the actual percentages vary quite a bit from company to company it is easy to see that there is much improvement needed. 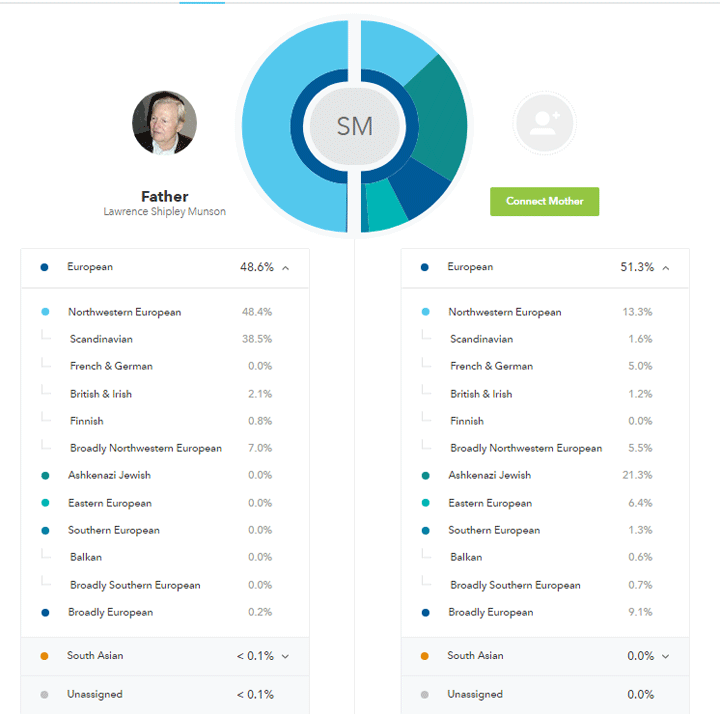 Somewhat alarmed that 23andMe, which I had always thought was the most accurate of the three, did not predict Irene’s Scandinavian correctly, I decided to double check the predictions for my Norwegian-American Dad, as well as my brother who is tested at all three of the main companies. 23andMe lists Dad’s Scandinavian at 72.8% which is actually an improvement over the estimates in 2012 which are pictured in this old post: http://blog.kittycooper.com/2012/12/new-ancestry-composition-tool-at-23andme/ but the 9.8% British is a puzzle, Is it really British or are they Scandinavian? Remember my Viking ancestors did a lot of visiting there. My brother and I know our ancestry for the last 300 or so years. Our mother was half German Jewish and half German Bavarian, back to the 1700s. Our dad’s ancestors, as previously mentioned, were all Norwegian for more than 500 years except for one fourth grandad born in 1722 who was a German engineer (expected to contribute about 2% of Dad’s DNA). A little over a year ago I did a comparison of the DNA ethnicities predicted for my brother at the three main companies, 23andMe, Ancestry , and Family Tree DNA. I sent cousin Irene to that article – http://blog.kittycooper.com/2016/04/ancestry-composition-comparisons-a-case-study/ – but upon reviewing it, I noticed that it was a bit out of date, so here is an update. 23andMe has added a number of fun features. A particularly useful one is a button to let you share your ancestry report via a link which you can either copy or send using email, facebook, or twitter. Irene used that feature to share her predicted ancestry with me. 23andMe has also changed the presentation of the parental split of your ancestry to include percentages which is very nice (you need a parent tested to get this). My brother’s percentages have not changed very much but now I can see that the trace of gypsy (South Asian) is on dad’s side. Maybe the 2% British from dad is that German fourth grandad. The Jewish DNA is the same 22% that all the companies see and mother’s Bavarian must be the traces of Scandinavian, German, East European, and Balkan. The timeline representation shown below is an interesting idea but remember that it is just an approximation. The possible empty slots for Finnish ancestors on Dad’s tree are all back in the 1600s. There is no known Finn in the predicted time spot. A while back I did a post showing how to get the actual ancestry composition segments from the 23andMe chromosome representation, see http://blog.kittycooper.com/2016/12/ancestry-composition-numbers-by-segment-at-23andme-com/ – this is still one of my favorite features. 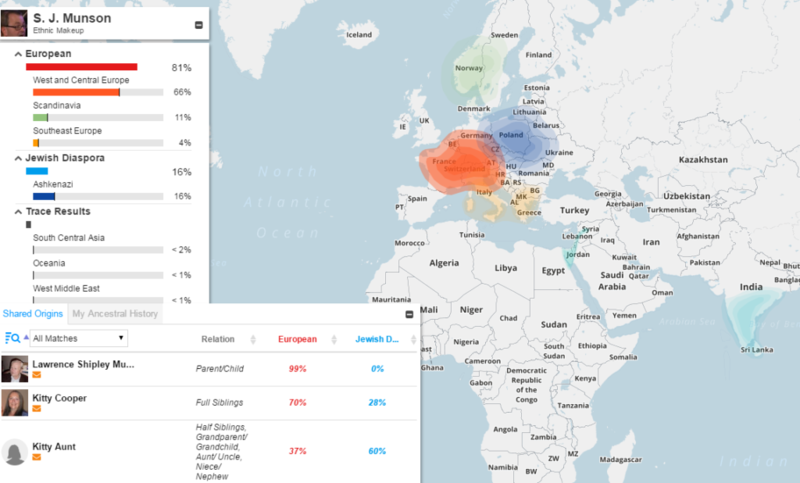 Ancestry has not changed its predictions much, My brother is still 62% Scandinavian and 22% Ashkenazi Jewish plus many trace regions for the non Scandinavian part of the German Bavarian. However the page is much more attractive to look at plus it includes the genetic communities feature discussed in this post http://blog.kittycooper.com/2017/03/genetic-communities-at-ancestry-are-live/ – my brother is in the Western Norwegian community. Family Tree DNA has significantly changed their predictions for my brother, with the exception of the Ashkenazi which has gone down just a little from 18% to 16%. There is no more British, the Scandinavian DNA is halved to a mere 11% and most everything is now just lumped into “West and Central Europe.” Checking Dad’s account there he shows 89% Scandinavian so most of that has morphed into Western Europe for my brother. To get to the nice map display shown here which gives breakdowns on the left and a map on the right you have to click on View myOrigins Map on the first clunky ancestry composition page. That next page, shown above, has a nice feature, if you opt in, of showing your shared ancestry with relatives, but in just one or two broad categories. For us those are European and Jewish. Apologies to the newer testing companies, MyHeritage, and LivingDNA, for whom I have no results for my brother yet. I also looked at the places where I uploaded his results, DNA.land and GEDmatch. Those have not changed since the original article cited above. UPDATE 30 May 2017: So after I published this post and went to sleep an email arrived … MyHeritage DNA ethnicity results have just been released! A quick check of my eight family members there showed that the Ashkenazi and Scandinavian are being predicted accurately for my immediate family. However my half Norwegian, half colonial American (English) second cousin is being predicted as 97% Scandinavian! Another case of English being viking? Great analysis. One of my understandings is that each DNA testing company uses different population samples with which they compare their individual samples. If this is true, then, there will always be differences between the results posted by each company in their “origins” results. That is my understanding also and that they used the self reported ethnicities of their testers. My previous article does link to each companies “white paper” describing their process. 8.9 cM and 6.5 cousin. Just FYI. I have 24 full Ashkenazi Jewish people related to me on Gedmatch, and yet I show 0 on my origins for Ashkenazi diaspora and less than 1 percent Sephardic. It is wrong. I found my dad, a Ramirez. A researcher said she doesn’t even both to look at my origins. Just FYI, again. FTDNA: was 10%, then 3% “Finland and Northern Siberia”, now 0% “Finland and Northern Siberia” or “Scandinavia”. Bryan – How much Scandinavian did you expect? Good question. My genealogical paper trail is rather young at this point. So far, I have been able to document my paternal line back to all 8 great-great-grandparents; only 4 great-great-grandparents through my maternal grandmother. My maternal grandfather? Well, I have his name and place of birth…his line is a bit of a mystery right now. 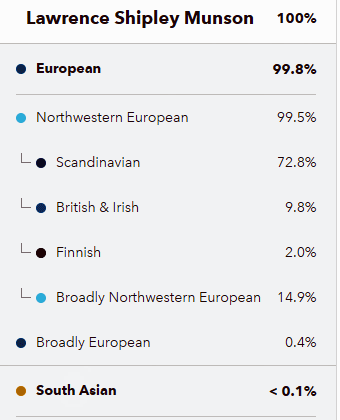 That said, I really didn’t know what to expect concerning Scandinavian ethnicity percentages. My “known” ancestry (at least what I have been told from childhood): Irish, Scottish, German, French, American Indian, and talk of the possibility of some distant Spanish and Dutch. Scandinavian was never mentioned as far as I can remember. However, here is a funny little story: when I was a teenager, there was a Swedish lady that had recently moved into my neighborhood (here in the US). She was a pastry chef that had retired from baking for the Swedish royal family. She used to bring us the most delicious goodies! This dear lady would frequently tell my mother and me that we were Swedish. She was dead serious about this. In fact, I still have a decorative ceramic tile that she once gave us as a gift for our kitchen. It says: “Bordet är nu dukat.” Maybe she was on to something? Thanks Kitty – great blog. I have pretty good knowledge of my family tree/ethnic background and Family Tree DNA ethnicity estimates definitely seem more what I’d expect than Ancestry’s. I find a useful reference point is looking at the family trees of matches where they have these go back a bit. Together, these sources have given me some big clues and enabled me to work out a lot of possible connections. For example, I know that one set of great-grandparents were Middle Eastern Jews, one from Iraq with Yemeni and Palestinian parents, one possibly from Syria or Iran with possible Sephardic rather than Mizrahi heritage (this is on my direct paternal line so I’m hoping to get a bit more clarity on this through a Y DNA test). Looking at my ethnicity estimates, Family Tree DNA nails it with 25% Middle Eastern originally then with the revised estimates 18% Sephardic and 7% Middle Eastern, while Ancestry seems a bit clueless with a mix of Causcaus and Asia Minor adding up to only 14% of my ethnicity, with the other 10% seeming to show as Italian. I also have a high frequency of Israeli, Iraqi and Iranian cousin matches which line up with both my family tree and FTDNA’s estimate of ethnicity. But there are some surprises. I consistently get a small Eastern European or Ashkenazi component – 1-2%. This is not explained in my family tree. However, I have a high number of Ashkenazi 5-8th cousin matches from (or with ancestry from) Poland, Belarus, and Lithuania so it is hard to dismiss. One big surprise in my Ancestry ethnicity estimate was an Italian component of 10% which seems like a mistake… on the other hand, I also have a number of matches with family trees going back exclusively to Italy over many generations. Sicily is a common factor in these marches. A DNA match I have exchanged trees with who has Iraqi heritage has suggested this could relate to the Sicilian Jewish community, which received Spanish refugees in 1492 and then faced its own expulsion in 1493. Obviously that last bit falls into the category of highly speculative links, but they sure give a lot to think about! (But I don’t have a better theory as to how I have so many 100% Italian American cousins whose grandparents and great-grandparents ALL came from Sicily!) I think a family tree + ethnicity estimates (a few different ones is best) + matches with family trees starts to give you some quite strong evidence. The new DNA Land ethnicity estimate is pretty interesting too. Kitty, they dispersed from Lviv, not Kiev. Gary D Anderson’s Sephardic Jewish DNA segment on chromosome 22 has been validated through triangulation and phasing. Also, through segment analysis I’ve confirmed a small amount of genuine Jewish ancestry in one 100% East Sicilian person so far: Joey D, who talked about this in the Eupedia and GEDmatch public forums. I hope to find more Sicilian-Jewish DNA links in the future. The rest of the breakdown 53% British, only 8% Irish? which is weird since my Great great grandparents both came from northern Ireland…and the families had been there for ever..well maybe they were Viking decendants? 6% Iberian peninsula ( probably my dads fathers family who had been in Wales forever? 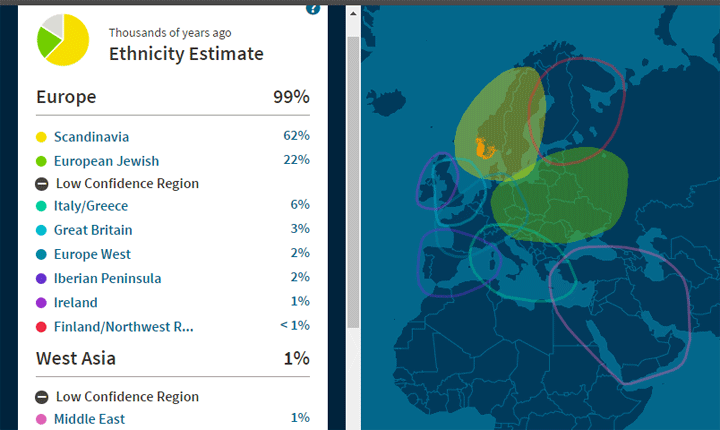 2% European Jewish,8% Western European(my German grandfather?.. 4%Italian/Greek(they changed that to southern European lately..at Ancestry.. Try no scadanavin on 23 and me and 30 something on Ancestry. My two test completely contradict each other. My cousin and I used ancestry.com. She has 3 grandparents born in Denmark, 1 in Norway. I have 2 grandparents born in Denmark and Norway. Neither of us have ancestors from Great Britain. Her dna results were 63% Great Britain and 33% Scandinavian — mine were 39% Great Britain and 30% Scandinavian. My theory is that the dna has been influenced by slaves from Great Britain (England, Ireland, Scotland, Orkneys, etc) brought to Scandinavia during the Viking era (750-1200). Does my theory make sense? Thanks for any help you can provide! Just got my results from My Heritage. With no real knowledge of my background there were no surprises but plenty of questions. I came back 95.2 English, 3.2 Central Asia and 1.6 Nigerian. Maybe I expect too much but was disappointed that the 95.2 North and West Europe was so broad. I am new to all of this and like I said, guess I expected too much. I just did my DNA through Ancestry and was shocked at the results!! My mother’s family has documented Native American blood for several generations back and I’ve had a tribal card since birth. Im 31 and have identified as Native American my whole life, being fairly dark complected with very dark brown eyes and black hair. My ancestry results show only 7% Native American, but 78% Great Britain, 5% Scandinavian, 4% Iberian peninsula, and only 3% Irish(also very surprising since I have a great grandfather that was supposed to be 100% Irish!). Should I test through other companies? I would recommend uploading to GEDmatch and DNA.land and see what their calculators say. Those numbers would suggest just one gg-grandparent was a native american. There could be an adopted Anglo or two in your native line. A great grandfather would be expected to contribute about 12.5% and Irish often shows as Scandinavian. You might also try testing at 23andme which has excellent ancestry composition results; but remember, none are that good yet, it is an emerging science, and it all has to be taken with a grain of salt. Another person shocked due to my DNA results from Ancestry. I knew going in that I was primarily German and Scottish. I have my German relatives traced back to the late 1700’s and my Scottish relatives back to the late 1600’s. I have not paid the extra at Ancestry.com to trace Europe. My paternal Grandmother and my maternal Grandfather are both full blooded German (supposedly). And my maternal Grandmother is primarily Scottish. Not sure about my paternal Grandfather as he was a deadbeat Dad who abandoned his family. 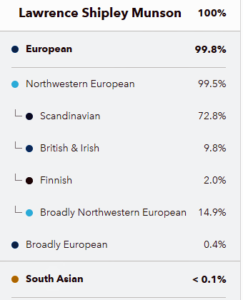 Imagine my surprise when my results said 28% Scandinavian. I understand that there is a DNA connection to the U.K. and Scandinavia as well as one with Germany. 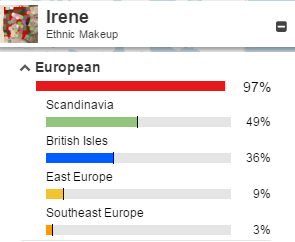 But I find it strange that the percentage of Scandinavian is higher than my U.K./Germany DNA. I also read that Ancestry has a “Scandinavian” problem where their results are abnormally high. I have no idea about Southern Europe either as it is Italian and Greek. I have uploaded my raw data to GEDmatch and DNA.land so I will have to wait for the results. Any thoughts? Thanks! Sorry- Just saw your response to Bruce and it is pretty much the answer I was looking for. I guess a Living DNA test is in order. I am just going to assume for now that I am 54% U.K. by adding my Scandinavian/Scotland Ireland Wales/Great Britain results together. Now I am only curious about Southern Europe.